How to clearly explain my customers the benefits of using my product? We have written about it before: you can bring information about your product to your customers in many ways. For example, you can create a knowledge base. By the way, it lost in the previous battle, seven-zero. But knowledge base is not the only way to present information about your product. This is one way your customer may learn about you. But it is a fast introduction, not a review. Texts for a customer that realizes what he is looking for is a whole different thing. He might not know about your company. Instead, such a client can find your product because of its functionalities — like a good integration with other services. And of course, you will need relevant content to present it. Some companies would choose whitepapers and e-books. Both e-books and whitepapers are pdf files that contain useful information on your product. You can usually download this file on your computer before reading, and you may be asked to leave your email to receive your pdf. These texts may vary in size and complexity. Whitepapers are typically 10–15 pages and written in a complex language. They are perfect for people who are well versed in a described subject, being “the last step” before purchase. Whitepapers are all about straight facts. E-books are longer than whitepapers, some are 50+ pages long. E-books are written in a more easy-to-read manner, being a bit closer to an advertisement. They are created for a wider audience, not only for specialists. There is one strong similarity between e-books and whitepapers: they both are good for complex products, especially the whitepapers. Of course, you can write an e-book for a simple product. But sometimes you cannot describe it in multiple words or it is better to present your product with interactive elements: videos or animation. E-books are useless in this case. And here is the first great advantage of an Academy — you can create it for a product of any complexity, any reader and in any form — as a plain text or in an interactive format. The first point is for Academy! The first point is for Academy! E-books and whitepapers are sometimes available in a specific website section. However, they can be found on the main page, as well as on any other. Anyway, these texts do not create a “free flow” with other pages. E-books and whitepapers are a separate type of content, especially when they are downloadable. Academies, on the other hand, are organically integrated into the website content structure. They are stored in a cloud, so your learners have no need to download anything from your website. Also, Academies are published on your subdomain. It looks like Academies got the second point. Nobody likes to read large and boring blocks of text. Sometimes ebooks and whitepapers feel like tons, tons of words… 💤 Yes, yes, we know it — ebooks and whitepapers are not always just plain text. You can add some diagrams and images, too. Oh, don’t forget about statistics and case studies. And that’s all. Okay, do you really want to limit yourself that much? In Academies, you can make your story a lot brighter: slides, videos, animation, quizzes. In other words, everything that makes itdynamic. Sorry, e-books and whitepapers, this point goes to Academy. Are you sure it’s convenient to create a new document for every update you make? In Academies, everything is done within minutes or even seconds. All you need is to edit your content inside your Academy and save it. Ta-dah! The edited text is on your website. Looks like someone deserves one more point! How much do you know about your users’ interaction with e-books or whitepapers? And do you know the points that your users find boring or complicated? When you rely on a pdf file, it’s impossible to know at what point exactly did your reader stop reading. Also, you will never know whether he opened your text at all, let alone the fact of sharing pdf with somebody. Academies have a solution. They include not only detailed statistics on each learner, but also very useful learner churn funnels. All you need is to go to statistics section and you will easily find out strong and weak lessons of your course. You will, therefore, understand clearly where to improve your content. So easy! Remember: Academies, e-books, and whitepapers have quite a similar goal. They all help establish contact with users — current or potential. They simplify life for clients and increase understanding of your product. In other words, all three help you prepare your customers for communication. There is nothing complicated about converting your current e-book or whitepaper into an Academy. In case you need help with conversion, you can write our team — we will describe and show you the fastest way. You will get a content with improved readability that is easy to edit. And don’t forget about statistics in your Academy! With it, you will find weak spots in your content within seconds. 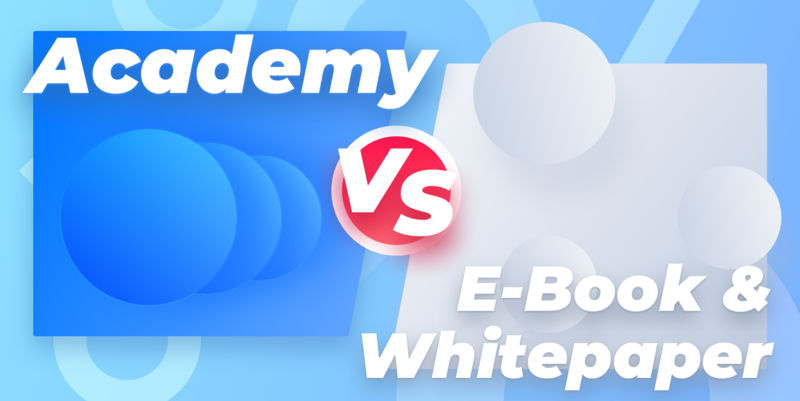 In case you have a very complex product, you can have both an e-book/whitepaper and an Academy. The first one can contain dry technical details, while the second would friendly explain to your customers how to use your product.